Cath grew up with rescue dogs and her mum is still rescuing now. Cath works in HR and when she started working from home she knew it was the right time for her to have a dog again. A friend of hers put her in touch with Claws and Paws so she went to see them with a view to adopting Masa, now Cali. Holly, now Suki, (seen in the picture) was also there. So unable to to make a choice between the gorgeous girls, Cath decided to adopt them both! Cath says "It’s the best thing we’ve ever done. 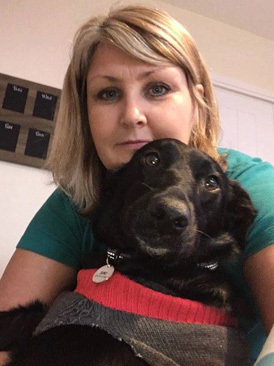 I was so touched by everyone at Hope VMS Elaine's Dogs, who originally rescued them and by the team of fosterers of Claws and Paws and all that they do that I wanted to help in any way I could." Cath decided to join the Hope VMS Elaine's Dogs admin team and uses her amazing HR skills to help fundraise and promote the rescue . Cath says "I want everyone to know about Hope VMS Elaine's Dogs and the wonderful work they do." Cath has become a power house on the fundraising team.